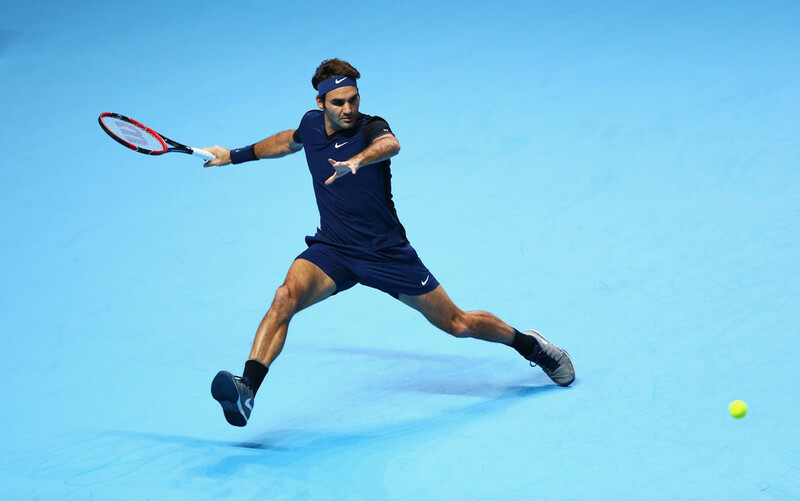 Six-time champion Roger Federer kicked off his ATP World Tour Finals campaign in strong fashion, streaking past Tomas Berdych 6-4, 6-2 on Sunday night to open their London quests. Federer claimed his 49th match win at the season finale, which he is competing at for a record 14th consecutive year. He will next face top seed Novak Djokovic in a clash between Sunday's Group Stan Smith winners. Berdych won seven of the first eight points to take a 2-0 lead, before Federer regrouped to work his way back into their 21st meeting. The Swiss broke Berdych to love, then could not convert two break point opportunities in the fifth game. Berdych dropped his serve to love in the ninth game and Federer calmly closed out the opener 6-4. "Clearly it was not the best start," said Federer. "It was a bad start. One of the worst starts I've had in years. No first serves, two double faults, nothing coming from the baseline. It was rough." The World No. 3 kept his foot on the gas in the second set, breaking immediately for 1-0 and once again in the third game. He countered the Czech's aggressive start with an attacking finish of his own, closing out the win after 70 minutes. Federer struck a jaw-dropping eight drop shot winners and converted four of six break chances. "Thankfully I was able to pick it up. The surface does play slow here. If you get to see too many second serves, clearly you can crawl back into the match. You can get your chances from the baseline to find rhythm quickly. "It's hard to blast through an opponent here in London, which I think helps for me now against Berdych in this case because I can make the match athletic. As the match went on, I definitely started to play better, started to serve better. I think what I underestimated a little bit in some ways was that it was a first round. I think I was playing very well in practice. I had a very good idea with Severin and Stefan how I should play the match. "It was a good lesson for me to learn. But now I'm in the second round, so that's a good thing." Federer completed his fourth consecutive match win over Berdych, extending his overall record to 15-6 in the ATP Head to Head. He is 3-0 in 2015, adding to victories at the ATP World Tour Masters 1000 events in Indian Wells and Rome.